The Curiosity team has a pretty good guess as to what it is. Mars is a dusty place, so when something shiny shows up, it stands out. NASA’s Curiosity team posted an update to its mission blog on Wednesday with a lovely look at a shiny lump sitting on the planet’s surface. The target of Curiosity’s curiosity is nicknamed “Little Colonsay” and it looks like a small nugget. The rover’s ChemCam captured a close-up view of the object on Monday. Curiosity’s ChemCam is a suite of instruments that includes a camera, spectographs and a laser that helps NASA analyze the composition of Martian rocks and soil. 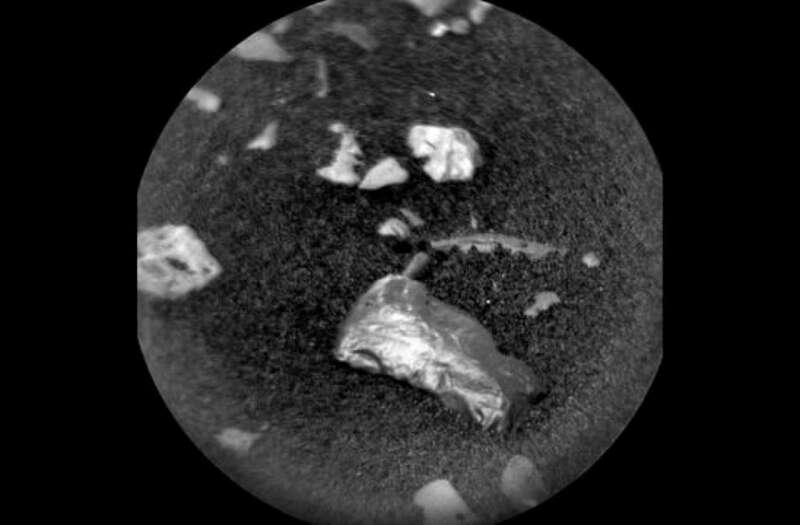 The rover is scheduled to investigate Little Colonsay with the ChemCam to determine if it really is a meteorite. NASA has spotted bright and shiny objects on Mars before. An odd bright piece seen by Curiosity in 2012 turned out to likely be a small plastic part from the rover. Another mystery particle from the same year was a little bit of Mars. NASA identified a strange flake-like object as a piece of Martian rock earlier in 2018. It won’t be surprising if Little Colonsay turns out to be a meteorite. NASA’s Opportunity rover found an iron meteorite on Mars back in 2008, the first time a meteorite of any type had been identified on another planet. Curiosity even found a jumbo specimen in 2014.